Great news! We recently added a brand new range of Lyon Wire Rope Anchor Strops to our height safety range. Lyon are a leading distributor of high-quality outdoor equipment including, climbing, mountaineering and specialist equipment! These wire anchor strops from Lyon can be used to keep you safe while working at height or during emergency rescues. They are made of high-grade 7mm galvanised steel which ensures the anchor is strong enough to hold the weight of a person and also helps to preserve the integrity of the wire anchor strop, even if it is used in harsh conditions. We can also offer these Strops in 7mm stainless steel wire which are perfect for longer-term exposed use or for use in marine environments. As you can see, the wire anchor strops have swaged thimble eyes at each end and are covered in a polyester reinforced PVC sleeve to protect the wire. They also have heat shrink over the swage to protect it and increase its overall lifespan. Lyon has really gone out of their way to ensure these wire anchor strops will keep you safe for years to come! We offer these wire anchor strops in different lengths and colours. The different colours help you identify strops of different lengths and easily work out whose is whose when you’re working or climbing as part of a team! In our Wire Rope Anchor Strop section, you will also find this G-Force AZ410 Wire Connecting Lanyard. 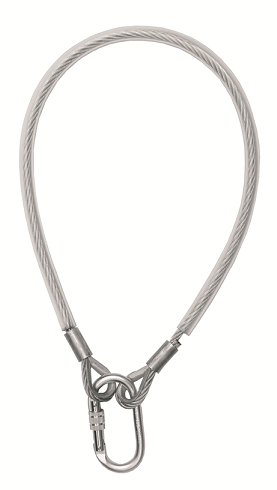 Just like the wire anchor strops, this wire connecting lanyard is made of galvanised steel and comes with a protective PVC cover. This connecting lanyard should ONLY be used as an anchor in a fall arrest system! Choose from 2 metre or 5 metre lengths. Take a look at our brand new range of wire anchor strops by clicking the button below or, if you have any questions, don’t hesitate to get in touch!